Bamboo Toothbrushes – a small step to eliminating daily toxic plastics? We have a huge plastic problem! It is literally everywhere and is a toxic problem as it is part of our daily lives. Plastic pollution is an epidemic primarily because it never biodegrades and it never goes away. An astonishing 50% of the plastic we use, we use just once and throw away. It is flooding our landfills, oceans and streets and does not solve the problem of long-term waste. It’s also a huge problem for the health of wildlife, as many animals ingest it thinking it is food and can have problems thereafter breathing and digesting. How do we make plastic more sustainable? The bottom line is that there is simply too much plastic for our world to handle, and the problem is getting worse. Therefore today’s solution is less about recycling and more about minimizing plastic consumption and supporting brands that have innovative solutions to plastic production and waste. If we listen to our dentists, we should replace them at least every three months. That means we all chuck 4 plastic toothbrushes into landfill each year because they aren’t recycled. That is 40 toothbrushes a decade. Say the average age we live to in the UK is 80 something. That’s around 320 plastic toothbrushes each, and then times that by 66 million. Feeling queasy yet and not just because maths makes your head hurt? It takes about 200 to 400 years for a plastic toothbrush to actually decay, and scientifically plastic doesn’t decay. It just deforms and moves into either the soil level or the water level. So that’s 4 toothbrushes, per person per year, think about how many years worth of plastic each person is adding. So what’s a solution? Bamboo. Who would think, bamboo? If brands can work towards eliminating plastic straws, why not Toothbrushes? 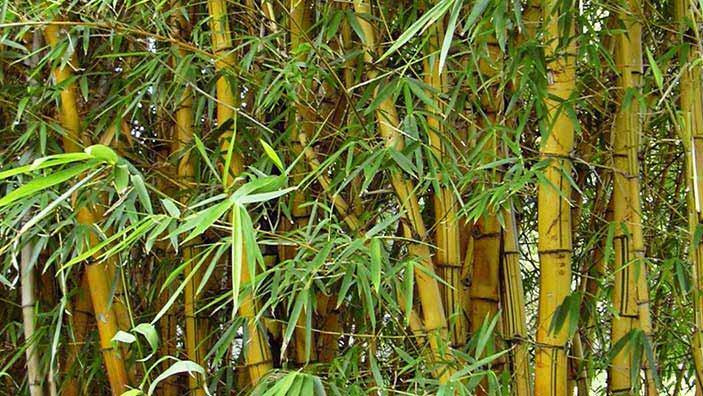 Bamboo is sustainable because it is so fast growing, and it biodegrades. If it is a choice between a wooden handle and adding to the ever-growing pile of plastic toothbrushes in landfill I know what I’m choosing. With plastic being such a massive detriment to society, switching out the first plastic thing you use in the morning, the toothbrush is a good approach for the average consumer to reduce plastic. Bamboo toothbrushes are more expensive, in monetary terms alone. When you factor in the cost to the environment and the fact that plastic is made using oil, a non-renewable resource, the real cost of a plastic toothbrush becomes more apparent. If you are planning on bequeathing your plastic toothbrushes to your grandkids and they to their own grandkids, then you’ve eventually got your money’s worth environmentally speaking. Switch to stainless steel bottles, and bamboo straws! Grocery bags of course, there are so many natural options like Jute and Cotton bags. If there is one industry that gets the most backlash for not being sustainable and helping to save the ecosystem, it would probably be the fashion industry. Last week, fashion brands Public School NYC and Elieen Fisher teamed up to launch a limited edition, zero-waste collection. The collection contains three ready to wear designs which are remade from previous designs. This is one of Elieen Fisher’s collaborations towards being more sustainable. Dao-Yi Chow, one of the designers of Public School cosigns the initiative by stating “This is one of the most important collaborations we’ve worked on in terms of providing visibility and awareness around a critical issue — sustainability within our industry”. I find this collaboration important to the fashion industry because it fuses a younger brand who is important to pop culture and an iconic brand to highlight a bigger issue- sustainability. The Elieen Fisher Renew program has redone more than one million designs and has a factory in Irvington where they received about 6,000 pieces of clothing a week. More fashion companies should take note of what Elieen Fisher is doing. This article makes me wonder if it is possible for a company to create clothes with a cap and should they be regulated by government to monitor their output? In The Case for Commons Health Care, an article published in Explore: The Journal of Science and Healing, he highlights how a tragedy of the commons is underway in health care, agriculture, and our global climate (onthecommons.org). There has been a push by Health Systems like the NHS and Kaiser Permanente in the United States to promote community ownership and involvement in healthcare. This means community involvement in the decision making process of fund allocations, community campaigns to educate people on healthy living lifestyles. Education on prevention and behavioral changes that will impact health. The system cannot survive unless preventative care and behaviors of patients changes. Currently, health systems are treating very sick people with health issues that are preventable by behavioral changes. Healthcare systems can no longer continue to run as profit systems that fill as many beds as possible, writing as many tests and overutilize resources. It must be a preventative system that uses the community to create social awareness around healthy living and ways to prevent illness by lifestyle choices and access. Healthcare needs to be seen as a lifestyle and a place that promotes healthy living and care for our bodies. Will developing countries agree that the Paris climate deal was the “best chance we have” to save the planet? Saturday 12th December 2015 marked the climax of the world’s first climate deal to limit global warming to no more than two degrees centigrade above pre-industrial levels. Furthermore, 196 countries attending the COP21 talks in Paris made the ambitious agreement to “endeavour to limit” the rise in global temperatures to 1.5 degrees, and beginning at some point between 2050 and 2100, to limit the amount of greenhouse gases emitted by human activity to no more than the planet can absorb naturally, therefore effectively “neutralising” CO2 emissions. Hailed by the US President as “best chance we have” to save the planet, how feasible is this [partly] legally binding agreement and how will the reductions in greenhouse gas emissions to meet this goal be apportioned between the developed and developing countries? First of all, the COP21 agreement hasn’t yet been signed and sealed. In order for the deal to go through, no less than 55 countries representing at least 55 per cent of global emissions now need to ratify the agreement. Beyond that, according to scientists, to meet these goals, the world would have to stop emitting greenhouse gases (that is, burning coal, oil and gas for energy) entirely within the next 50 years. This sizeable shift would require a complete reform on how people obtain energy which many critics argue most countries cannot afford and are not ready for. Climate researchers have also warned that even if all the initial targets set in preparation for COP21 were met, global warming would still exceed the two degrees threshold (see image below). UK Prime Minister, David Cameron posted on his Facebook profile that, “I said it would have to come with regular reviews; help for the poorest in the world; and a transfer of technology from the richest to the poorest nations. It does all those things.” So how have these “things” been met as part of the agreement? It was agreed that each country’s proposed reductions in emissions would have to be reviewed every five years in order to establish their individual progress. Rich countries would also be required to help poorer countries by providing “climate finance” to help them adapt to climate change and adopt renewable energy. This figure was agreed at a conservative $100bn a year by 2020, which when put into context, is only equivalent to 8% of the worldwide declared spend on military each year. Direct compensation for developing countries taking the brunt of climate change was categorically ruled out. With so few details on “climate finance” available at this stage, contrary to my previous blog, my view is that we should be a little sceptical about expanding the concept of such finance. Could this simply be enlarging an existing finance scheme governed by developing countries to rack up unmanageable debt in the developing world? How accessible will these “funds” be and with what strings attached, and who knows how much of the budget will be taken up by corruption failing delivery on the ground? As the system currently stands, there is no internationally consistent definition of what “climate finance” is or how it is tracked both in terms of monitoring outcomes and financial flows. Specific targets for individual countries have been omitted from the agreement for the reason that certain countries which could be considered to be developing for example China, India and South Africa refused to sign up at the Copenhagen talks in 2009 for fear that the targets would stall economic growth and development, as discussed in my previous blog. Instead, the pledges are voluntary and although the obligation on individual countries to set an emissions-reduction target under five-yearly reviews is legally binding, the COP21 deal so far does not insist that the targets themselves will be legal binding but are instead in control of each individual country, which leads me to believe that the whole concept could be ineffective. How will the impact of climate finance be measured? Who will enforce the pledges that each country declares at the five year intervals? Quite apart from these and other issues, the pledges made prior to COP21 aren’t, according to Climate Change Tracker (see image above), enough to keep global warming below the 2-degree centigrade threshold (above pre-industrialisation levels), so the agreement to “save the planet” is already a fallacy. I believe that it is more likely that we will see the effects of climate change intensifying, particularly for those that have done little to cause it, than a global shift in the way we utilise energy. Rather than sitting and waiting to see what happens next, you and I, as individuals should take up our responsibility of global citizenship and investigate the ways in which we can play our part in taking on board 350.org’s message to look beyond the COP21 agreement and do as much as we can to strive for “a just and liveable planet” each and every single day. By being given more information, which must come from the world leaders, we can also all adjust our behaviours accordingly. 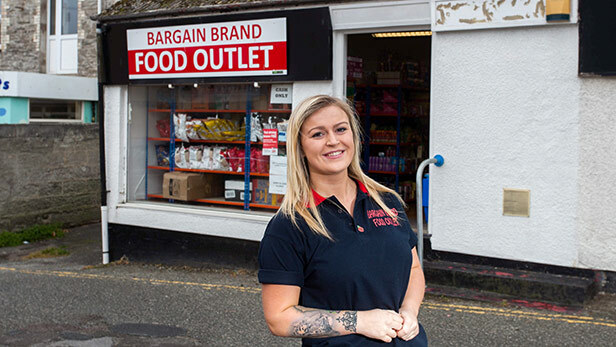 A 20 year old Charlotte Danks from Newquays in Cornwall has opened a shop that sells unwanted supermarket stock. The shop is to assist cash-strapped shoppers who prefer not to visit foodbanks. Supermarkets offer their unwanted stock which may be reaching its sell-by date, has damaged packaging or incorrect labels. Ms Danks. The food she sells is “unfit” for supermarket market shelves and would otherwise end up in landfill. Ensuring that no supermarket ever has to send anything to the landfill could help prevent food waste which has a huge carbon foot print. The big questions are: are supermarkets prepared to give away all that they send to the landfill? Will this not reduce their profitability? What about the stringent health and safety rules? Can Ms Danks model shop could be replicated in every community? So far, there has been great success in her shop and she plans to open two others in St. Austell and Penzance. Ten London boroughs no longer offer a meals on wheels service, which provides healthy meals for vulnerable and isolated older people at risk of malnutrition. Some 1.5 million children nationally are currently disqualified from receiving because their parents receive tax credits to top up their low wage work. There are an estimated 220,000 London pupils living below the poverty line who are not enrolled in Free School Meals. That means 18%, or one in five London pupils, are at risk of hunger during the school day. Over half a million children in London will struggle for food during school holidays. In the light of these statistics, the replication of stores like Miss Danks’ across the country especially in London where the cost of living is high would be beneficial to many people. Some people are uncomfortable visiting food banks but shops like these would ensure that low income groups of people can obtain food at minimal prices. Having just witnessed the madness of Black Friday sales here in the UK, where we don’t actually celebrate Thanks Giving, a day dedicated to gratitude, and instead simply jump straight into the ‘buying’ part, (now also followed by ‘Cyber Monday’, the online equivalent), it got me thinking about why we actually do this to ourselves and how this thirst for a ‘bargain’ can continuously be quenched in the long run. How many more ‘sale’ days can companies actually come up with? Following Black Friday we have Boxing Day, when we can get all this rubbish for even less money. Then comes New Years, Valentines, Mother’s Day, Father’s Day, Birthdays, End of season sales, Mid-season sales, Halloween, Guy Fawkes etc…the list is endless. If retail companies could, I’m sure they would add extra days onto the year just to create more ways to shift their stock as quickly as possible. The Christmas month has long become a commercialised, frantic time of year when people stress about buying presents that nobody needs and take out pay-day loans to pay for it all. All simply because we are made to believe that this is normality and that it will make us and our children happy. Most children I know are happy playing with a cardboard box and don’t really care for the latest toy until, of course, they are presented with the idea on television. 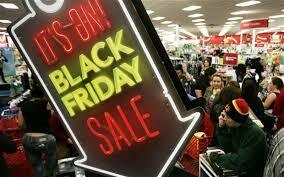 In fact retailers are investing most of their time and money in keeping our society as ‘consumerised’ as possible. And let’s face it, it’s working! We as a society are brainwashed and always hungry for more cheap products we don’t need and probably shouldn’t buy. Constantly being confronted with adverts wherever we go is bound to have an effect on our behaviours. Believe it or not, there is actually a whole science behind this. “Watch your brain and watch your wallet,” says Ian Cook, professor of psychiatry at UCLA. It is estimated that the average American saw 560 daily advertising messages in 1971 and by 1997 this number increased to over 3,000 per day (Shenk, D., Data Smog: Surviving the Information Glut, 1997). That’s 6 times the amount! I wonder what that figure looks like today, 17 years on? Thinking about it I now almost feel abused. I have to be honest, if I didn’t see that new pair of shoes in the magazine, I wouldn’t have wanted to buy them, because I don’t actually need them. Today we even have bloggers advertising for companies, seemingly for free, because people will actually read stuff about stuff. Ironically, many of these bloggers actually make money through…you guessed it…online advertising and affiliate marketing! All of this doesn’t just affect our brains or our wallets, it also affects our environment. In fact, 99% of what we buy is thrown away within 6 months as highlighted by ‘The Story of Stuff’ project (check out their very informative video). Something’s got to give when we are living in a cycle of buying and discarding, buying and discarding. Most of the materials to produce this stuff are sourced from poorer countries because we have actually run out of them ourselves. For example the US has less than 4% of its original forests left (Brown, L., Renner, M., Flavin, C., Vital Signs, 1998) and according to the book Natural Capitalism (P. Hawken, A. Lovins and L. Hunter Lovins), in the past three decades, one-third of the planet’s natural resources have been consumed. How could our planet ever sustain this? Plus, it’s not only the environment that is suffering. One of the main reasons that these products can be sold so cheaply and still make a profit is because companies are exploiting cheap labour from people who have no other choice but to work for pennies, people from countries where the average person simply can’t afford to ‘shop till they drop’. 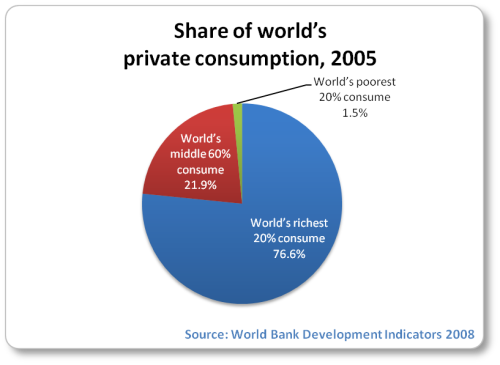 All this is called, Inequality of Consumption. These figures are shocking but who is to blame? I guess, people like me who allow themselves to be brainwashed not knowing or being ignorant of the effects it has on the rest of the world. On top of this, our own governments largely support and promote consumerism because they themselves depend on it in order to keep up this image of economic ‘growth’, promising us happier and better lives through increased consumption. But do you actually feel like you have a better life when you consume more? I can tell you that I myself do not obtain long term happiness by buying that pair of cheap shoes, especially when knowing that someone has been paid a fraction to actually make them and that the very thing I physically depend on, our planet, is being destroyed in the process. We hear so many people comment on how they long for a ‘simpler life’, yet in the end, most actually want to let go of the ‘luxuries’. But does a simpler life mean a worse life? We don’t have to go back and live in ancient times, surely. What do you think the solution is? Here are some examples for why we should minimise our consumption. Can we change our society for the better and promote a more sustainable way of life? I would be really interested to know what you think about this and what the answer might be. So let’s share some knowledge (without making money!) and post your thoughts in the comments section below. Thank you! As a United Kingdom based African Diasporan engaging in International Development, I am delighted to be a 2014/15 MSc NGO and Development Management student at the University of East London. The journey that has led me to undertake this task has been as exciting as it has been fraught with uncertainty. I am here in the quest for Social Justice for Africa and the African Diaspora ‘Development’ model. Gaining a thorough understanding of how to effect ‘good change’ (Chambers 1997) in development for Africa, particularly in my own country Zambia (yes I am home biased! ), is essential if I am to accomplish my quest successfully. As a child growing up in Zambia, my first real awareness of the international development discourse was during the Ethiopian famine. Images of emaciated people, children in particular, and the prodigious efforts and support that the rest of the world made to alleviate the situation were all imprinted on my young impressionable mind. However, I soon realised that a myriad of development issues were also present right there in my own country. Whereas our increasing significance as African Diaspora development actors, contributing to Africa’s sustainable, social and economic development, has steadily gained momentum, we remain an untapped resource with the potential of being the catalyst that will bring about the required traction to tip Africa’s future over this current development impasse. “With great power there must also come – great responsibility!” Stan Lee. Therefore, with all this power that we hold, what trajectory will we lead the African development discourse? What ideologies and theories will we espouse to and/or develop? In particular, how will my “diaspora activism” contribute effectively to enhancing the attainment of social justice for Africa? These questions, and more, are what I am hoping the MSc will assist me to answer. Calling a house a home. Is a home or a house a commons? I think the answer is yes. Over the centuries housing changed from being a commons to being enclosed depending on the geographical location and circumstances of communities and politics of the time. For example, pre-industrialisation housing was much more likely to be commonly owned in rural communities than in urban areas and cities. That is until the enclosing of common land which brought with it enclosing of housing and what has become known as tied accommodation. Then at the turn of the 20th Century and post world war one the UK appeared to recognise that housing should be a commons and strategically started to build affordable state owned housing that could be accessed by everyone based on need. In 1900 there was virtually no state owned or commonly owned housing, then by 1979 35% of people were living in social or council housing. However, the rise of neoliberal policy and Thatcherism changed this. Policies were introduced which lead people to aspire to home ownership and move away from affordable renting. However, what this also lead to was a greater divide between rich and poor. Communities changed as people moved to where they could afford to purchase property. This was also the era of the introduction of ‘Right to Buy’ on council and social owned housing stock. Tenants could apply to purchase their house at a hugely discounted rate and therefore become a homeowner. However, stock was not replaced and soon the number of people in housing need outstripped the amount of common housing available. Having somewhere dry and warm to live is a basic need and should be a fundamental right; however the number of homeless people is increasing. This is because access to housing is dependent on financial means and housing is not equally distributed. Therefore we now live in a state of unsustainable housing. Housing is driven by the capitalist market. People are being forced to rent privately, paying exorbitant prices for basic homes to feed the pockets of the few rich landlords. Or people continuously move from one house or community to another seeking something bigger and better, not consider what their actually need is. Has UK housing been enclosed? This week, Bill and Melinda Gates (co-founders of the Bill and Melinda Gates Foundation) visited London to speak about the achievements foreign aid has made in the fight against global poverty. In a presentation sponsored by the ONE Campaign titled “Living Proof,” the Gates teamed with Dr. Debrewerk Zewdie from The Global Fund to demonstrate how foreign aid has decreased child and maternal mortality and hunger, and increased average income and access to medical treatment in developing countries in the past decade. However, they insist that aid must be focused and distributed properly to be effective. But even so, is aid sustainable? Dambisa Moyo, author of Dead Aid: Why Aid is Not Working and How there is a Better Way for Africa, would confidently answer ‘no.’ According to Moyo, “over-reliance on aid has trapped developing nations in a vicious circle of aid dependency, corruption, market distortion, and further poverty, leaving them with nothing but the ‘need’ for more aid.” With problems ranging from lack of access to adequate education or clean water, to overexposure to deadly diseases or lack of access to health services, it is clear there are many needs in developing countries still being unmet despite the introduction of foreign aid decades before. However, the Gates argue that if foreign aid is approached properly, there are possibilities for sustainability and eventual weaning off of the need for outside aid. In their presentation, they showed there are many countries in Southeast Asia that have actually decreased their aid dependence in the past decade because projects were working (most notably India). Dr. Zewdie also stated that the Global Fund only supplies aid to governments that are able to contribute a portion of the cost themselves, and that many of them begin contributing more and more on their own over time. But this seems to be more of an anomaly, especially when looking at African countries which still rely heavily on aid. Today’s headlines in the UK bring up another worry for the sustainability of aid; the inability of rich countries to continue to provide it. As we learned today, the UK has made major budget cuts to the police, health, higher education, welfare, social housing and local government sectors. However, no foreign aid cuts were made, leaving some to wonder if the timing of Bill and Melinda Gates “Living Proof” presentation was perfectly planned to put global pressure on the UK to continue its foreign aid commitments. According to the progress of the MDGs, the UK is still behind in its promise to contribute 0.7% of its GNI to foreign aid by 2015 (it’s currently only contributing around 0.5%), so it wouldn’t be a stretch to assume the Gates had ulterior motives for choosing this week for their campaign. Without the global pressure the Gates brought with them this week, the UK may have been quick to make cuts to their foreign aid budget this year. And who could blame them with their current economy barely able to provide proper assistance to its own citizens? This scenario just exemplifies the fact that developing countries are at the mercy of the stability and economic climate of the rich countries still willing to support them. So can foreign aid ever really be sustainable? It appears the answer to that question relies heavily on the many different variables involved in the exchange, and maybe only time will tell.